Conard freshman Gavin Sherry, the first place finisher won the CCC cross country championships in 16:16.0 Tuesday, October 16, 2018, at Wickham Park in Manchester. Tolland won the CCC boys cross country team championship Tuesday at a muddy Wickham Park in Manchester behind three sub-17 minute performances from Jackson Cayward (16:42.5), Alec Sauter (16:50.3) and Stephen Sutton (16:55.4). Hall, Bristol Central, Conard and Glastonbury rounded out the top 5 boys team finishers. 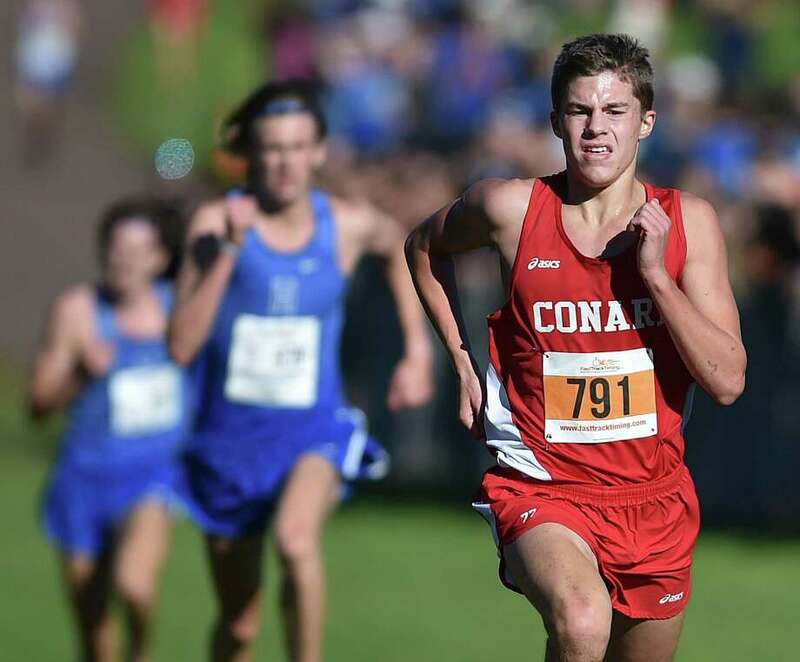 Individually, Conard freshman Gavin Sherry, who was outkicked by Hall senior Miller Anderson earlier this month at the Wickham Invitational, would not be denied on Tuesday, gaining momentum up the final hill at the course to win in 16:16. Anderson was second in 16:17.9. Glastonbury won the girls CCC team title, with Hall finishing second, E.O. Smith third, Tolland fourth and Southington fifth. Rocky Hill’s Elizabeth Stockman won the girls individual title in 18:57.20. Hall’s Jenna Zydanowicz was second in 19:06.50, followed by Dagny Edwards of Simsbury in 19:43.90. Rounding out the top 10 were: Rose Kitz of Hall (19:58.50), Casey Macelhiney of Glastonbury (20:02.70), Jackie Izzo of Southington (20:03.10), Angela Braga of Glastonbury (20:04.50), Francesca Lynch of Hall (20:20.10), Abby Potticary of RHAM (20:22.30) and Peyton Bornstein of Tolland (20:30.90).